This latest re-release from Arte Factum and Francisco Orozco offers a selection of music from a vast expanse of time spanning from the 12th to the 15th centuries. It also surveys a number of different forms from dances and troubadour songs and selections from Carmina Burana and the Cantigas de Santa Maria of King Alphonso the Wise. The booklet contains notes on the music in three languages and the texts for all the songs with Spanish (but not English) translations where necessary. The problems of performing this repertoire are, of course, well-explored arguments. What little music survives almost never includes clues about the intended instrumentation so that musicologists and performers must turn to other sources of evidence to inform their view of performance practice. In his booklet notes, Carlos Gonzalez Marcos explains that evidence from a wealth of disciplines has a huge influence over Arte Factum's current practice and to illustrate this he mentions iconographical sources in artworks and also quotes from Juan Ruiz (Archpriest of Hita c.1330) collating his observations to form a 'catalogue' of instruments. 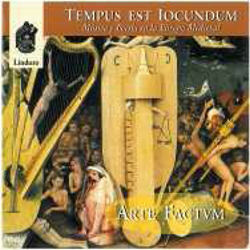 Using evidence from these different areas leads Arte Factum to a sound-world dominated by a colourful panoply of medieval instruments which, whatever your attitude to such combinations, offers an attractive and engaging sound-world and one reminiscent of that with which earlier pioneers like Noah Greenberg, Thomas Binkley and David Munrow first caught the public attention over 40 years ago. The opening track 'En mai la roussee' sets the tone for the whole album with its lively percussion and sprightly instrumental playing and it is performed with such conviction that listeners will, at the very least, find themselves tapping a foot. Then come the Cantigas de Santa Maria with the Francisco Orozco's dazzling solos. Orozco is clearly a very talented and passionate communicator and although some of his emotion is over-done for my tastes, his performances are quite persuasive and definitely 'in the moment'. The level of intense communication in the singing makes this an album worth hearing for that reason alone. The estampie and salterello featured later on this disc are now something like mediaeval 'hits' for the early music revival. The more Arabic/Moorish influence that one detects in Arte Factum's performances are closer to Binkley's recordings with Studio der Frühen Musik than they are to the more recent albums by The Dufay Collective. What is enormously pleasing is the sheer beauty of 'Kalenda Maia' (Vaqueiras) which has never ceased to amaze me in all the different guises I have heard, but here in particular there is, again, some of the most exhilarating percussion playing from Álvaro Garrido that is worthy of special attention. Although these medieval compilation albums have largely disappeared from the new catalogues they are far from an exhausted art-form. This re-release has renewed my enthusiasm and also served as a catalyst for revisiting some of the even older recordings of this music by the artists I have already mentioned. It seems that the plurality of performing practices that must have coexisted in the Middle Ages is now beginning to be reflected in the plurality that currently characterises the early music revival.